Got your 4th of July plans squared away? Whether you’re headed to the pool for some sun worshipping or going to a family barbeque to indulge in your aunt’s famous potato salad, you’ll need to dress the part. Get ready to channel your inner patriot, because we’ve done some digging and found the perfect 4th of July outfits. 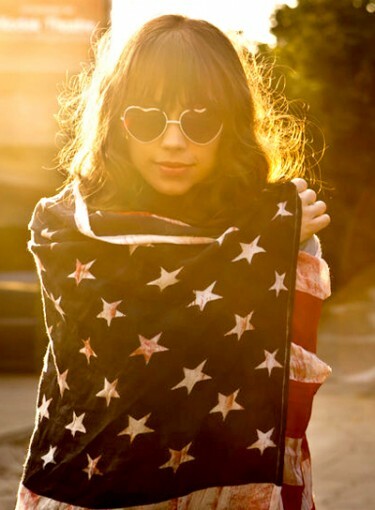 Click here to see our picks for the best 4th of July outfits. • Go for denim. Nothing is more classic Americana than blue jeans. Instead of dark skinnies, opt for frayed shorts in a lighter wash.
• Red, white, and blue makes everything patriotic. If you don’t have anything emblazoned with an American flag, no worries. This simple color scheme is a quick fix for an easy 4th of July outfit. • Look for pretty prints. Stars and stripes are classic, but polka dots in red or blue also give off a 4th of July vibe. • Keep it casual.Save the satin cocktail dress for a summer wedding, and go for low-key pieces like a cotton tank or denim cutoffs. Keep clicking for all things fashionably 4th of July.